Want to search and analyse online job vacancies and turn them into usable data? You can with Jobfeed! See for yourself the advantages of this huge online job database. The advanced search technology and detailed up-to-date knowledge of the job market make Jobfeed a valuable information source, analysis resource and acquisition tool. Jobfeed is Textkernel’s Big Data tool for jobs that automatically searches the Internet for new job ads every day. The jobs found are automatically entered in Jobfeed and classified according to criteria such as profession, required qualifications, location and company name. The data can then be enriched, for example with job synonyms, sector information and company data. The user-friendly Jobfeed portal makes it easy to search for all jobs, produce analyses, identify sales leads and set up job alerts. By combining Jobfeed with Match!, not only can you spot opportunities in the market, you can also find the best candidates for the jobs. Additionally, you can easily match a profile to all online jobs so you can quickly find that relevant job for your candidate, client or employee. 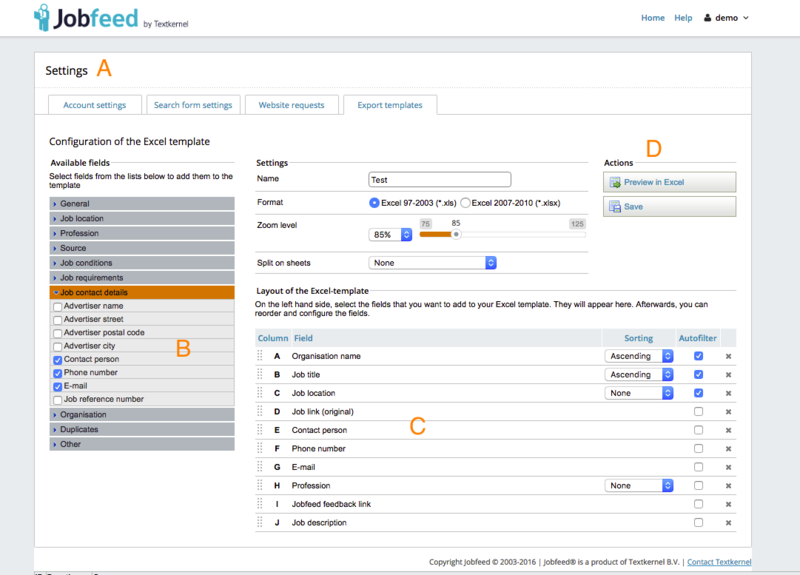 Jobfeed is available in several versions and boasts many useful features. The most common types and the main features are set out below. Would you like to know which type would best suit your organisation? Do you want to experience the application in up-close detail? Request a demonstration or contact us. * Is the country you want missing from this list? Contact us to discuss the current status of Jobfeed in your country. 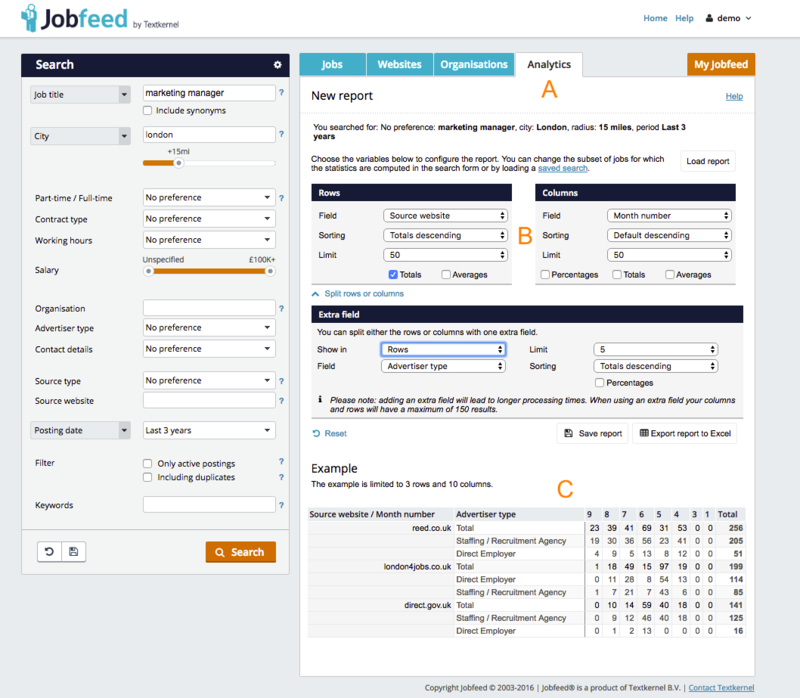 Jobfeed can be used for multiple target groups, for multiple purposes. For advice on which type of Jobfeed suits your requirements and organisation best, please contact us. With your personal login code you can search through all the jobs in the database. You can activate email alerts to keep up to date with the latest job ads based on the criteria you specify. On the basis of predefined fields and filter criteria, you will receive a Microsoft Excel file every day or every week. This will give you clear, comprehensive information on jobs of relevance to you, often including the name and address of the company offering the job opening. Jobfeed can match vacancies with your CRM database. Relevant vacancies are then linked to the customers and prospects in your system. The deduplication methodology is a unique aspect of the technology behind Jobfeed. Every job ad found is compared to all the job ads received in the past six weeks. 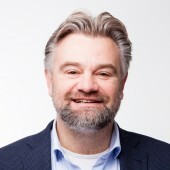 We can then accurately determine the number of unique jobs and produce a complete analysis of organisations’ advertising behaviour. You then have clean and clear search results. 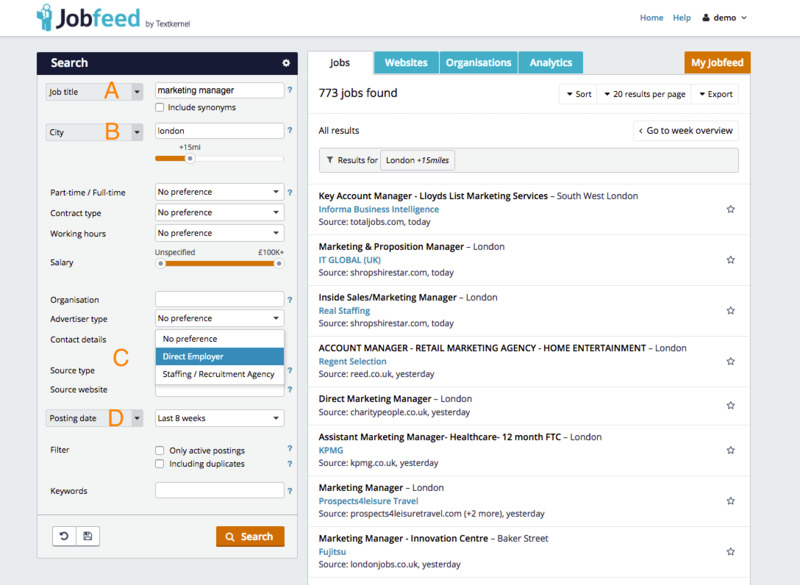 In addition to monitoring the source of the job ad, Jobfeed recognises whether the ad was posted by an agency or a direct employer. This ensures accurate analyses and targeted acquisition. 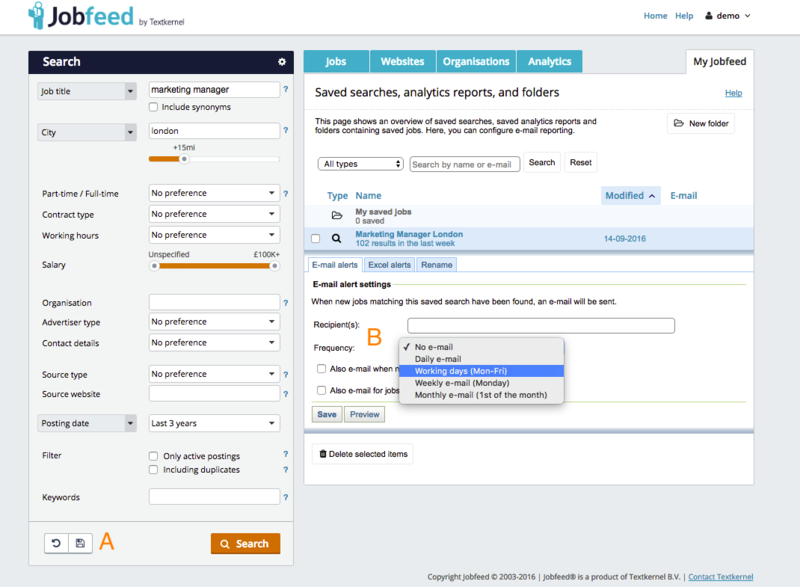 You can save your searches as search profiles in Jobfeed. By setting up email alerts you can receive the latest information of relevance to you every day, every week or every month. You can also see which jobs have been viewed by the recipients. Jobfeed automatically searches the Internet for new job ads every day. The jobs found are automatically added to Jobfeed and classified according to criteria such as profession, required qualifications, location and company name. The data can then be enriched, for example with job synonyms, sector information and company data. The user-friendly Jobfeed portal makes it easy to search for all jobs, produce analyses, identify sales leads and set up job alerts. Read more about the Jobfeed process. Using job parsing, Jobfeed obtains relevant information from jobs and classifies it by criteria. It is then subdivided into categories, so that you can easily apply filters. Filters are available for fields such as educational level, company size and sector. Jobfeed draws a distinction between jobs published by recruitment agencies and jobs published by direct employers. You can filter these in the portal. You can specify the period during which you wish to search for vacancies. For example in the last eight weeks, or within a specific date range. You can save your Jobfeed search so that you can easily use it again later. The saved search can be found under the 'Search profiles' tab. Under the search profiles tab you can see a list of all your saved searches. You can stay informed automatically of new jobs which match your searches by setting up e-mail alerts. You enter your e-mail address and the frequency with which you wish to receive these e-mails. In that way you will always stay up to date with the job vacancies relevant to you. Jobfeed Analytics users have an additional tab: Analytics. Under this tab you can produce customised reports on the job market. Jobfeed Analytics gives you the data you need to analyse the jobs in your search. All fields available in Jobfeed can be arranged for comparison. You can even break down your rows or columns further by adding another field. In this way you will gain an insight into the job market of relevance to you. When you have produced the desired report, you can save it for a future occasion and/or export it to Excel. You can analyse the data further in Excel. In Jobfeed you can easily produce templates to receive lists of Jobs in Excel. Here you specify the fields to be included in the Excel sheet. These could include job title, contact details, educational level, region, etc. You can easily drag and drop to put fields in the right order. You can even distribute data across different tabs. You can save each report. When saving, you can specify how often and whether you wish to send the reports by e-mail. You can specify multiple e-mail addresses. Jobfeed is a valuable source of information and is already being used by a large number of recruitment and staffing agencies, job boards, outplacement and redeployment organisations, government bodies, job market analysts, and corporate recruiters. 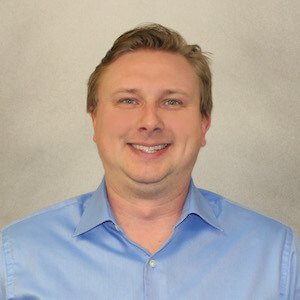 They are already enjoying the benefits provided by this unique analytical and acquisition tool. Read about their experiences with Jobfeed.